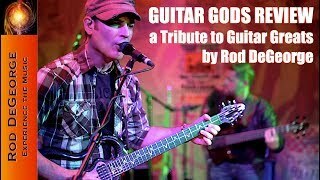 "Itʼs fun to zoom through all the melodies, shred bits and harmony solos, and then collapse with giddy exhaustion"
“If thereʼs any justice in the world, Rod DeGeorge will be one of the brightest stars amongst 21st Century new guitar heroes"
Welcome to the Official Site of Rod DeGeorge (Guitarist, Composer, Instructor & Performer). To experience some of his music, please visit the Media Tab where you can listen to full length songs in the Listening Room and check out some Live Performances, Official Videos, Promotional Videos and more on the Video Page. Feel free to look around and contact us with any questions, comments or inquires. Thanks! Check out the many reviews and quotes on Rod's playing here! ʻcause as bad of a time he had with Charlie, he would just be thrashed by Rod! Amazing stuff!! Great guitar playing, it makes me want to practice more! John Petrucci. Points: 15 out of 10 (not 10...15! ).